CAROLINA CHICKADEE NEST READY FOR EGGS. Photo taken April 16, 2013. 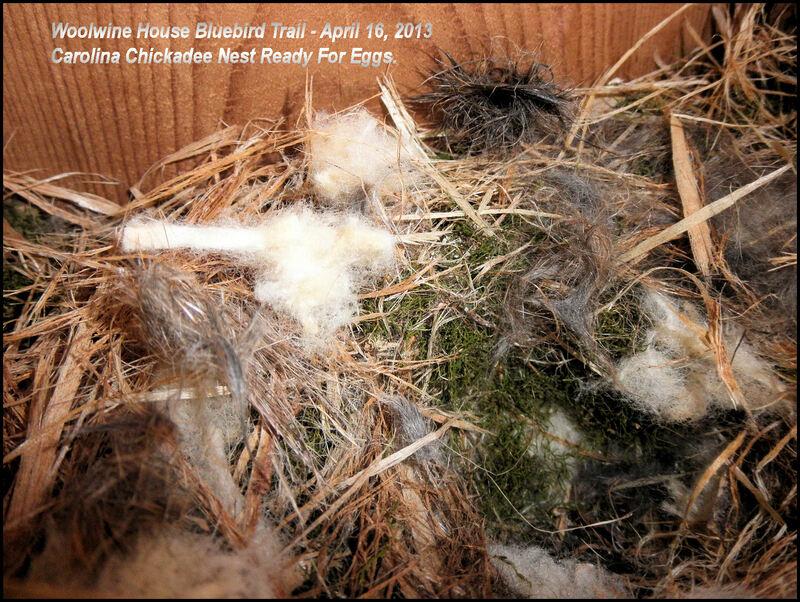 The Carolina Chickadee (CACH) loves nestboxes! That is the species of chickadee we have here. They only have one brood per year–many times they win over a nestbox with the bluebirds. But you see, that is A-OK….all native species are welcome. Manmade nestboxes; that is, those that are monitored and cared for, are prime real estate for the cavity-nesting birds! Chickadees seem to struggle to survive. Ornithologist are still studying why their numbers seem to be declining. In some areas, they are thinking West Nile Virus is the culprit. Loss of habitat, predators, and other reasons has been known–just like bluebirds. I’m waiting for the chickadee eggs to be laid. The cup is in the upper right corner of this photo. The chickadee can build a nest quickly but seem to take more time to get to the egg laying cycle. Just look at all those plant and animal fibers! Mosses, grasses, small dried leaves…so many interesting articles in the nest.